"The geography of the Missouri and the most convenient water communication to the Pacific ocean is a desideratum not yet satisfied." When Thomas Jefferson wrote these words, he could only hope that he was finally on the eve of realizing his western desideratum. In two days Meriwether Lewis would leave Washington to meet William Clark and begin their 'Voyage of Discovery' to the Pacific Ocean. However, the Lewis and Clark Expedition was not Jefferson's first attempt at initiating western exploration. Jefferson's original overture for a western exploratory party was directed to Revolutionary War hero, George Rogers Clark. He begins his 1783 letter to Clark with the two topics which pulled his thoughts westward: science and politics. He thanks Clark for sending him shells and seeds and assures him that he would be pleased to have as many bones, teeth and tusks of the mammoth as Clark might be able to find. Then within the same paragraph Jefferson reveals his apprehension at the rumor that money was being raised in England for exploration between the Mississippi and the Pacific, and even though it was professed as only for knowledge, he feared colonization. Jefferson then wonders, if money could be raised in this country for western exploration, "How would you like to lead such a party?" Clark declines Jefferson's request for financial reasons, but as a hero of the western theatre of the Revolution, he was quite knowledgeable of the Indians of the northwest territory and offered advice on how to best proceed among the Indian peoples, advice which Jefferson stored away for future use. In later correspondence Clark would recommend his youngest brother, William, as also knowledgeable of the Indian territory and, "well qualified almost for any business." 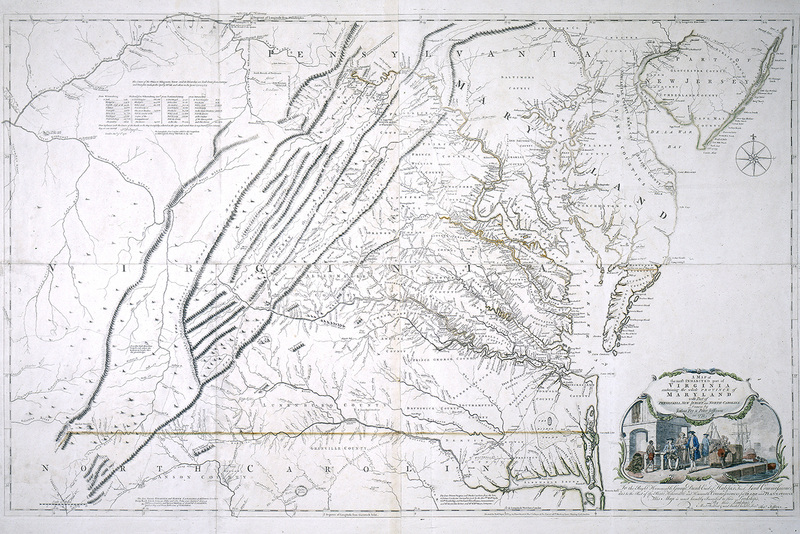 The 1751 map of Virginia drawn by Jefferson's father, Peter, and Joshua Fry, played a central in the life of the U.S. third president. While in Paris as minister to France, Jefferson joined in a plan for an American explorer named John Ledyard to cross Russia, obtain water passage to some point on the North American coast, and explore from the Pacific eastward. Jefferson supported the venture but noted that despite Ledyard's ingenuity and information, "Unfortunately he has too much imagination." Ledyard was arrested within 200 miles of Kamschatka, escorted to the Polish border and charged not to set foot within Russian territory again. A more promising endeavor was instigated by Jefferson and fellow members of the American Philosophical Society in 1793. They enlisted French botanist, Andre Michaux, "to explore the country along the Missouri, & thence Westwardly to the Pacific ocean." Jefferson organized the subscription to finance the expedition, and even though the undertaking was not under government sponsorship, he appraised President Washington, who offered to "readily add my mite" to the project. Jefferson's instructions to Michaux on behalf of the Society reiterated the objective of finding the shortest route to the Pacific with equal importance given to the gathering of geographic and scientific data. But the expedition began to unravel before reaching the Mississippi river, as it became apparent that Michaux was involved in a French plot to gather support against the Spanish settlements west of the Mississippi. An important remnant of this truncated expedition was Jefferson's written set of instructions to Michaux, which would reappear in a more detailed form when delivered later to Meriwether Lewis. These failed attempts undoubtedly added to Jefferson's store of information on western exploration, and when circumstances placed him in a key position to act, he was prepared to do so quickly and decisively. In his first inaugural address in 1801 Jefferson envisioned, "A rising nation, spread over a wide and fruitful land, advancing rapidly to destinies beyond the reach of mortal eye." Less than two years later, on January 18, 1803, he would deliver a confidential message to Congress outlining a plan for exploring to the "Western Ocean," and requesting an appropriation of $2,500 for what would become the Lewis and Clark Expedition. In May 1804, as Lewis and Clark were poised to begin pushing westward along the Missouri river, Jefferson must have felt more confidence in seeing his western desideratum fulfilled, writing: "We shall delineate with correctness the great arteries of this great country: those who come after us will fill up the canvas we begin."